Dark-coated, streamlined and graceful, the otter, typically three to four feet in length and 20 to 30 pounds in weight, celebrates its very existence. More than perhaps any other animal of the desert Southwest, it makes a game of life, playing tag with otter buddies, sledding on its belly, splashing into the water, and chasing after shells and pebblessometimes for hours at a stretch. 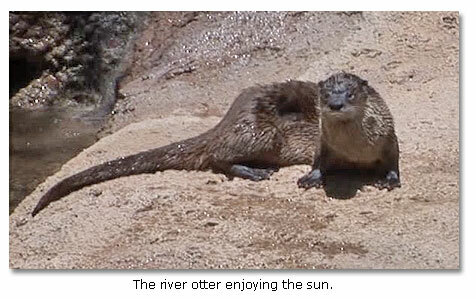 The river otter enchanted Native Americans, who wove tales about the animal into their legend and folklore. It captivated EuroAmericans, who used its name to identify more than 175 geographic locations in some 33 states, according to University of New Mexico biologist and river otter authority Paul J. Polechla in his Internet site, Otternet. Unfortunately, the animal’s thick, velvety coat has also attracted trappers, who  aided and abetted by habitat destruction and pollution  apparently wiped out virtually the entire Southwest river otter (one of several North American subspecies and a member of the weasel family) population a half century ago. Fortunately, the river otter, through reintroduction of imported species, may be about to stage a comeback in the Southwest, although not without controversy. Superbly designed for its semiaquatic life in stream, pond and marshy environments, the river otter has a long, supple, slender body with a long, muscular tail. It has an angular head with a broad snout and light-colored whiskers. 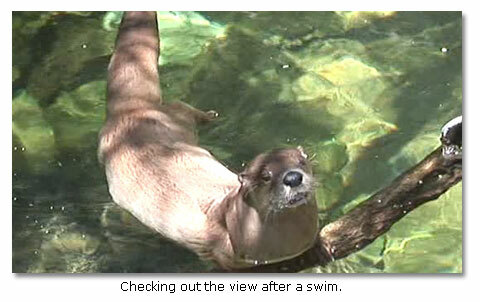 Amber-colored eyes with third eyelids function like goggles when the animal takes to the water. It has small ears and a bulbous nose with valve-like flaps that the animal closes under water. Webbed feet, with its powerful tail, propel and guide the otter through the water. Its coat, typically a dark rich brown down the back and sides and a light brown to silver along the belly and throat, has heavily oiled thick guard hairs156,000 per square inch, according to the COASTeam Aquatic Workshop Internet site. Its coat “traps air against the otter’s skin. This cushion of air keeps water from touching the otter’s skin, keeping it completely dry.” Like a wet suit, it also helps keep the otter warm in the frigid winter waters of northern Canada and Alaska. Although designed expressly for an aquatic environment, the river otter can run at speeds up to 18 miles per hour on land, said Eldredge. “Their vocalizations include a whistle, probably used to communicate over distances, and a shrill, chattering call, emitted during mating season,” according to the Arizona Game and Fish Department Heritage Data Management System Internet site. “Otters chuckle softly to siblings and mates, probably as a sign of affection, and also chirp, grunt, snort, and growl.” The male marks his territory with urine and feces, often deposited on logs or stones or brush and grass piles, leaving a powerful, musky odor to signal intruders. In the basins and ranges of our Southwest region, the river otter occupied the drainages of the Canadian River, in northwestern New Mexico; the Rio Grande, from southwestern Colorado through central New Mexico along the Texas/Mexican border; and the Colorado River, from north central Colorado through southern Utah and northwestern New Mexico and across most of Arizona, southeastern California and western New Mexico. Its preferred stream and wetland plant communities included the willows and cottonwoods of the basins and the birches and spruce of the mountains, said the Arizona Game and Fish Department. It particularly favored the deep clear fishy ponds created by dams built across streams by beavers. The otter, with a relatively low population density, occupies a range of tens of miles, and it may cover several miles during a night’s foraging. It may move overland for several miles, from one body of water to the next. Most active at night, it pursues a diverse diet, which can include foods such as fish, crustaceans, amphibians, water insects, small mammals and birds and their eggs. Once it captures a meal, it retreats to a secluded spot along the bank to eat, said the Seneca Park Zoo Internet site. It “almost always eats fish from the head back (swallowing bones and all but discarding the tail); stalks aquatic birds by approaching from underwater; raids bird nests for eggs & nestlings…” It uses its sharp claws and teeth “to capture and tear…food into swallow-able chunks,” said COASTeam. 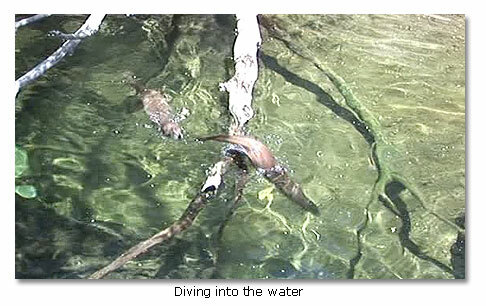 In the water, the otter faces few enemies, but on land, it may fall prey to bobcats, coyotes, eagles and other carnivores. With good luck, however, the river otter may live for 10 to 20 years in the wild. With birthing time approaching, roughly a year after mating, the female river otter retreats to her den. Typically, she delivers two to four eight- to 10-inch, five-ounce blind, toothless and helpless “kits,” which will remain sequestered in the den with their mother for two and a half to three months. As the kits develop, opening their eyes after about a month, the female river otter  the consummate single parent, with no assistance from the male father  nurses her young, usually for about four and a half months. She introduces them to solid food at around three months. She acquaints them with water when they reach about two months of age, sometimes even carrying them on her back as she swims. She teaches them the otter arts of swimming, diving and hunting. “…she captures and releases food so that the young can develop foraging skills,” said the Seneca Park Zoo Internet site. After about a year, she has completely trained and prepared her brood, which then leaves the nest to begin independent, adult otter life. If the otter charms us with its joie de vivre, it also contributes to our environment in several practical ways, primarily by helping sustain a natural balance among species and helping improve conditions for game fish. “They tend to eat ‘trash’ fish that compete with the more economically beneficial fish,” according to the Wildlife Response, Inc., Internet site. 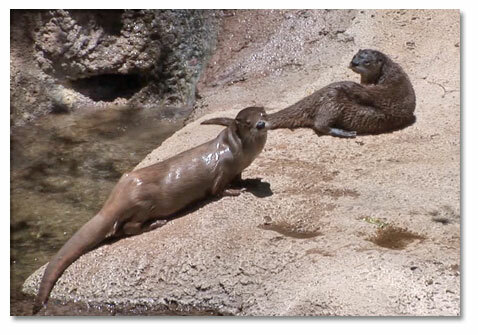 The river otter preys heavily on undesirable introduced species. It relishes crayfish, helping control an intrusive species that causes increased turbidity and siltation, causing damage to native plant and animal communities, according to the Four Corners Institute’s Melissa Savage and Jon Klingel, “The Case for River Otter Restoration in New Mexico.” Importantly, the river otter serves as a gauge for the quality of our waters and a symbol of the original richness of our land. The Southwest river otter population suffered most at the hands of the trappers of the 19th and early 20th centuries. The decline accelerated as communities and farmers cleared and altered habitat, diverted water supplies and polluted streams and ponds. Except, possibly, for a few small remnant populations in isolated streams or ponds, the Southwest river otter had totally disappeared, becoming extinct, by the 1950’s. In the Southwest, the animal began its long comeback in the state of Colorado, where biologists re-introduced a few otters, from Minnesota, in 1976. In Colorado, according to a recent conservation assessment prepared for the U. S. Department of Agriculture by biologist Steve Boyle, the river otter, augmented by subsequent reinforcements from Minnesota, Wisconsin, Michigan, Virginia, Oregon, Washington, California, Alaska and even Newfoundland, has extended its range into the upper Colorado River, in the Rocky Mountain National Park; the Gunnison River, in the state’s west central counties; the Piedra and Dolores Rivers, in the state’s southwestern corner. In Utah, where the river otter has apparently never been very numerous, the animal has nevertheless become reestablished in river drainages in the eastern half and the west central part of the state, according to the Northern River Otter Management Plan prepared by the Division of Wildlife Resources. Its population has been supplemented by small numbers imported from Alaska and Nevada. It has a good chance to expand its range under the plan. In New Mexico, where the last known river otter died in a beaver trap on the Gila River in 1953, the animal found new hope in the fall of 2007, when the Department of Game and Fish began restoration projects on the upper Rio Grande drainage, in the north central part of the state, and on the upper Gila River drainage, in the west central part of the state. The otter’s reintroduction has raised the opposition of some sports fishermen, who think the animal may prey on their favorite game fish. It has whetted the appetite of trappers, who still yearn for its fur. It has caused concerns among environmentalists, who point out that the replacement otters derive, not from the original species, but from imported species, and is therefore not really a true reintroduction. The environmentalists fret, too, that the otter may prey on endangered species such as the humpback chub of the Colorado River. In fact, the day when we routinely see “our playful fur-bearing friends once again diving and swimming in our rivers!” in the Southwest is still well in the future.